With Christmas fast approaching I’m feeling ever so slightly stressed! I have been so disorganised this year, so I’m rushing around trying to make sure presents are ready to go under the tree and the decorations are up before the family arrive. I think it’s very easy to get lost in the hustle and bustle and by Christmas day end up completely wiped out and unable to enjoy yourself. I’m a big fan of self-care, and at times like this I think it is more important than ever to put yourself first for a bit and recharge your batteries. Putting a day aside just for you can make such a difference, so I thought I would talk you through my pre-Christmas pamper day in case you need any ideas. Of course a whole day would be fantastic, but it’s not necessarily going to be possible at this time of year. But even if you can just put aside an hour or two to do some of these things I think it will help you find a bit of peace in an otherwise crazy few weeks. I start my day by putting on one of my favourite Christmas jumpers. This particular one came from Primark this year, but I have quite a few from last year to choose from as well. 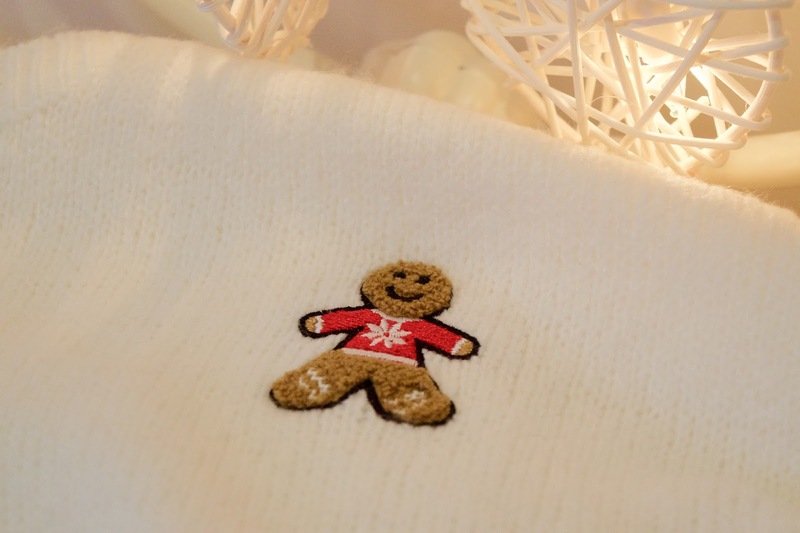 I do love to dress up at Christmas, but for a pamper day you definitely need to be in something warm and comfy. To be honest I don’t have a long list of plans for during the day. I prefer to just go with the flow and not put pressure on myself to do things. One of my favourite things to do is snuggle up on the sofa, next to the Christmas tree and under a fleecy blanket, and have a Christmas movie marathon. These are some of my favourites – I try to buy a new one every year to add to my collection so I still need to get a few of the classics like Elf. 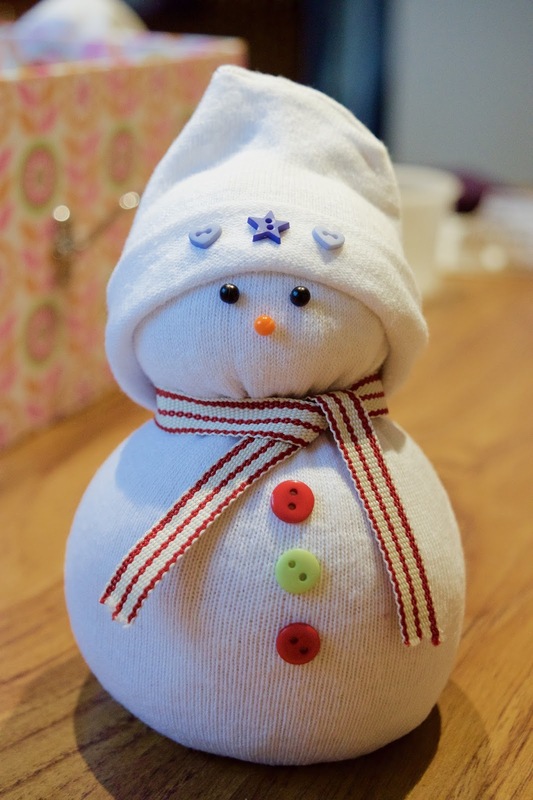 As well as watching Christmas films I also think it’s fun to do something more creative. 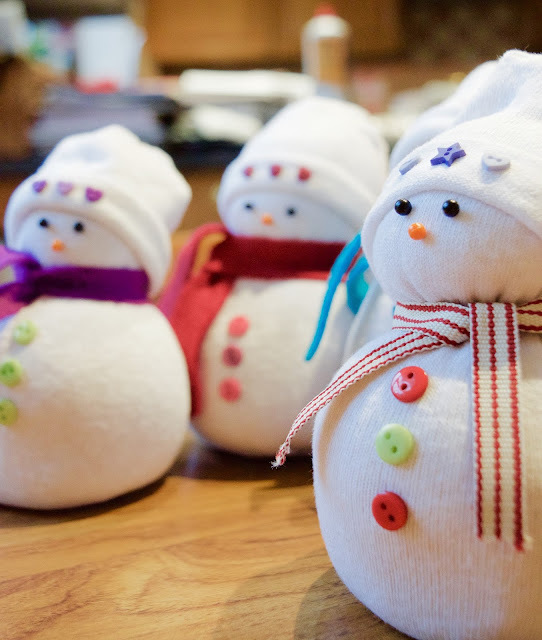 There are so many ideas on Pinterest for craft and baking activities to do around Christmas. 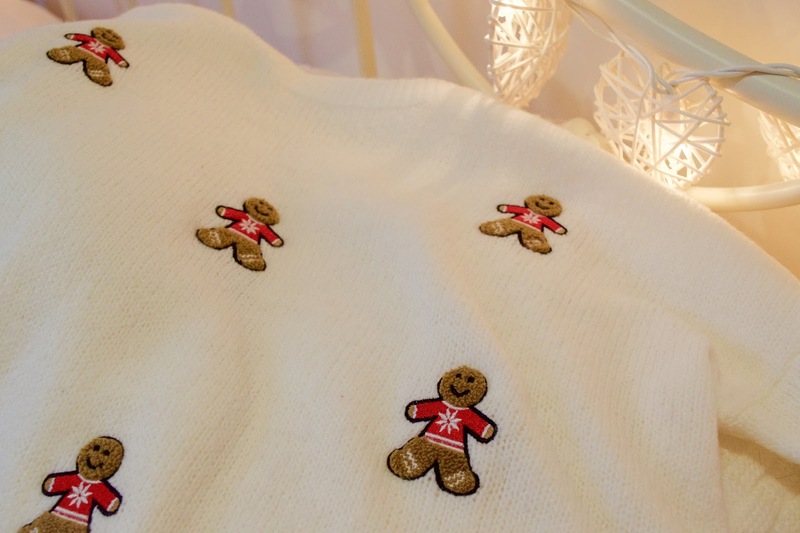 I particularly enjoy baking gingerbread men (or if you turn them upside-down you can turn them into reindeer!) 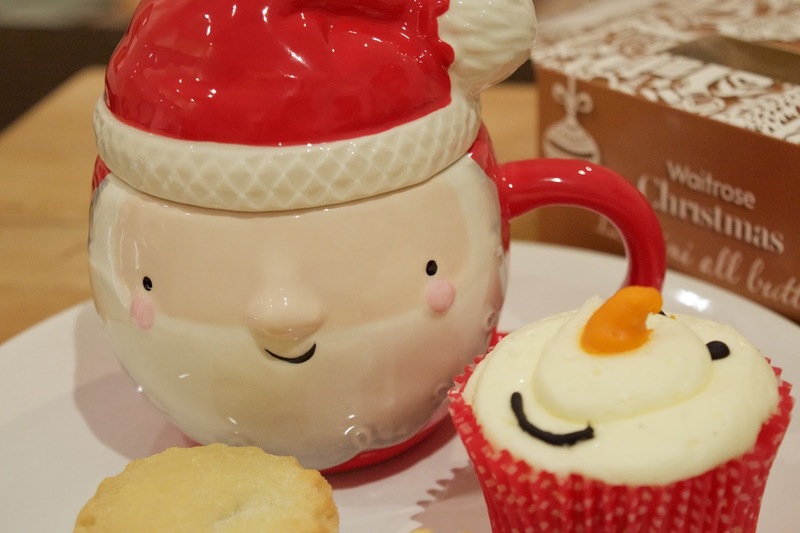 or Christmas cupcakes, but if you don’t fancy getting your bake on you could do something crafty instead. I decided to have a go at making these sock snowmen with my friend. They were so simple to make (check out YouTube for instruction videos) and would either make great last minute gifts or decorations to add around your home. As the evening starts to draw in, I like to treat myself to some wintery snacks. 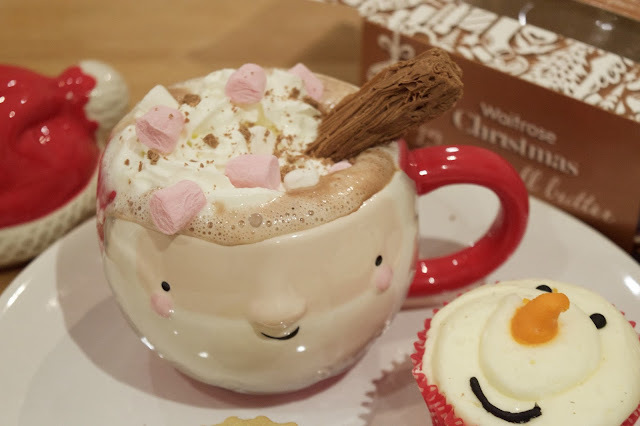 You can’t beat a proper hot chocolate when you’re pampering yourself. I made mine in this adorable mug from Next, which is perfect for this time of year. They do a whole range of pieces in this design – from a teapot to a side plate. I was also a bit peckish, so added this cute snowman cupcake from Waitrose (they do a range of characters in different flavours) but you could pick whatever treat you fancy. I settle back down on the sofa with these, and decide to flick through some Christmassy magazines while I watch some Vlogmas YouTube videos. Next up, it’s time for some real pampering! 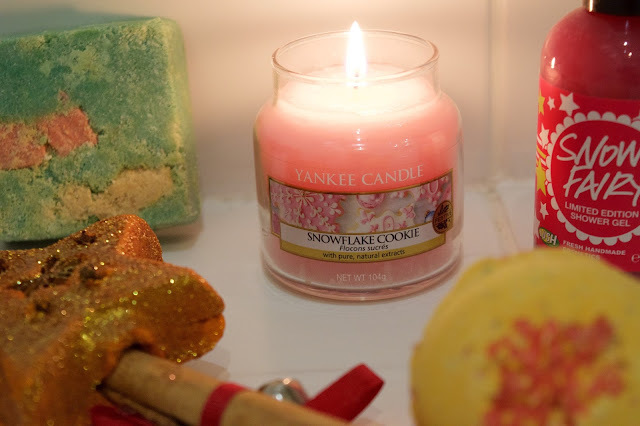 I like to light a candle in my bathroom – this time I chose a Snowflake Cookie Yankee Candle to help me get into the Christmas spirit. 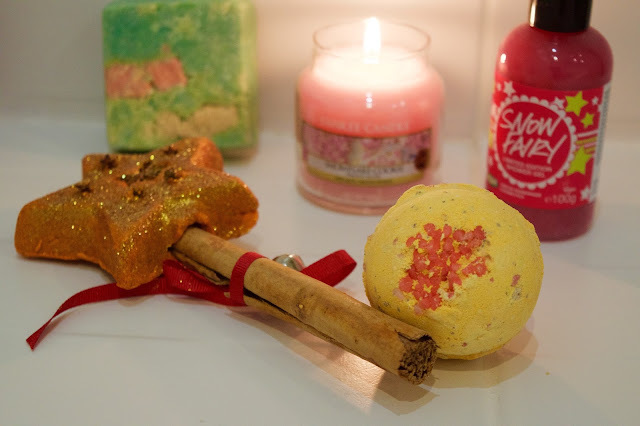 I then chose a selection of Lush goodies along an autumn/winter theme to make my bath time super relaxing. 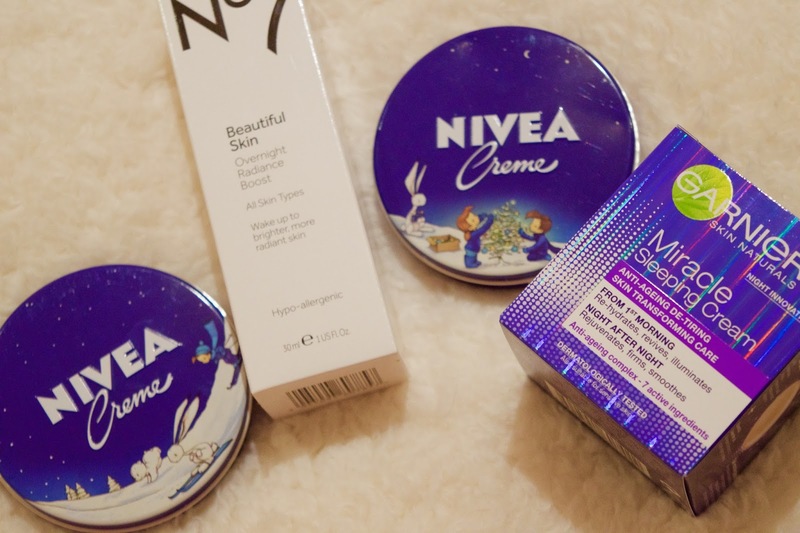 I’ve got an assortment of products here, as I couldn’t decide which to show you! 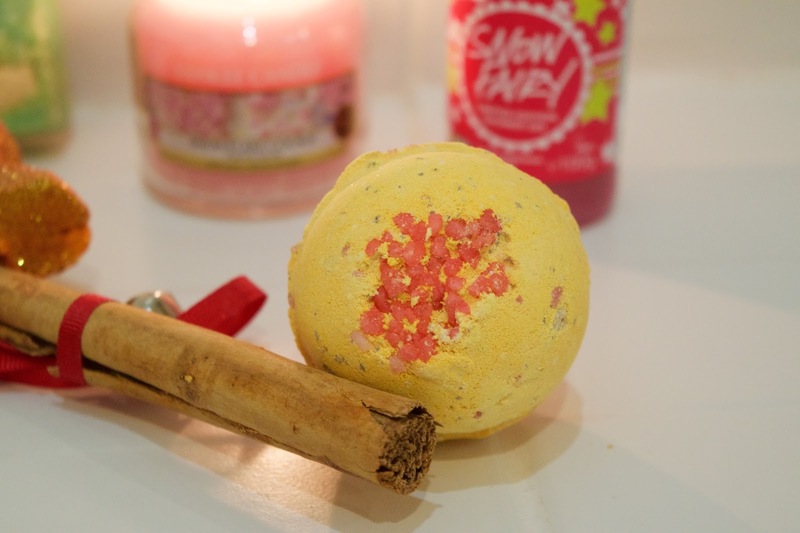 Of course there had to be Snow Fairy, my absolute all-time favourite Christmas product. If you’ve never used it, it’s an incredibly sweet, pink, glittery shower gel – it kind of reminds me of Calpol! I then picked out this Cinders bath bomb because it’s a very autumnal product with stimulating cinnamon leaf oil and even a sprinkling of popping candy. Next up, for some exfoliation, I picked the Salt and Peppermint Bark. Again, it’s very Christmassy, packed full of peppermint oil, making it smell just like a candy cane. Last up, I decided to go really Christmassy with The Magic of Christmas reusable bubble bar wand. 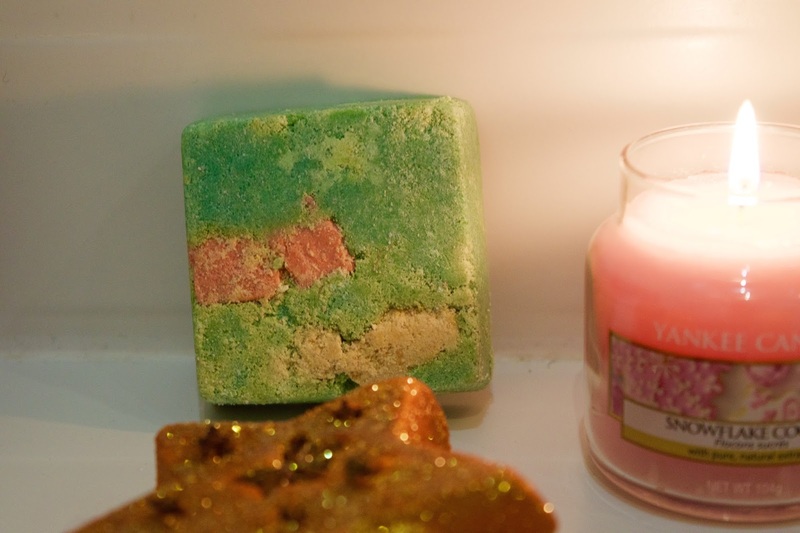 These make such a fantastic gift as they give you several baths full of plenty of bubbles and sparkle. 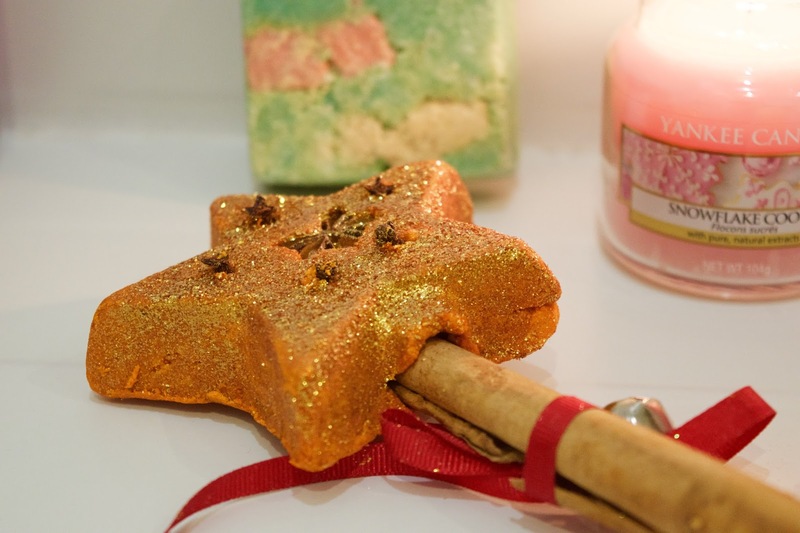 This particular one comes with a cinnamon stick and is packed with punchy cinnamon leaf and Fair Trade Organic clove to stimulate the skin and boost circulation. While I’m in the bath I like to give my face a bit of TLC. 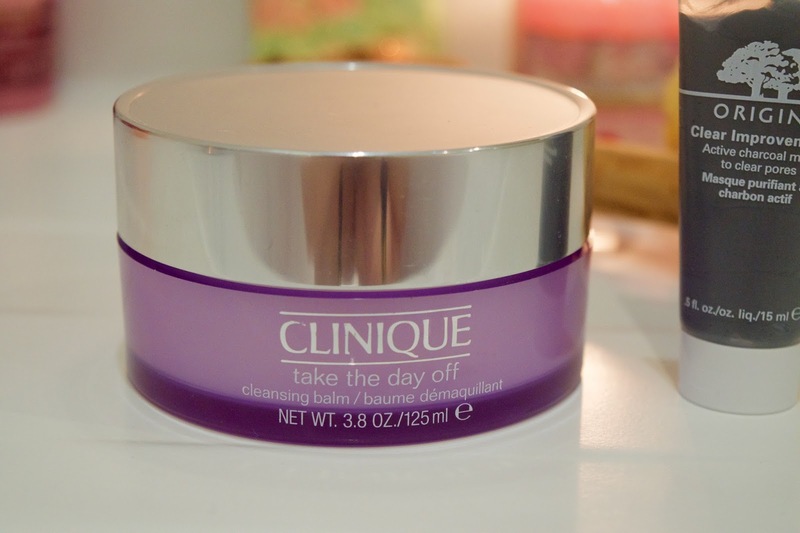 First, I remove any make-up with this Clinique Take the Day Off cleansing balm, which leaves my skin feeling clean and glowing. 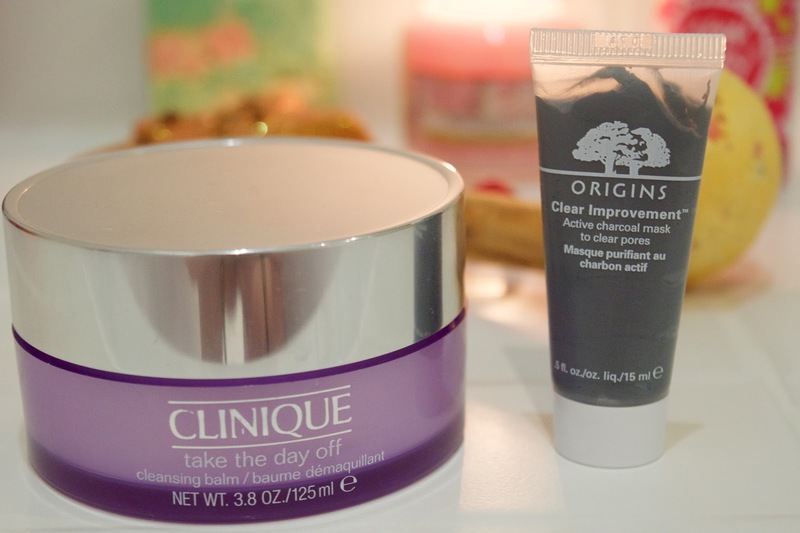 I then like to use a facemask to really nourish and clean my skin. 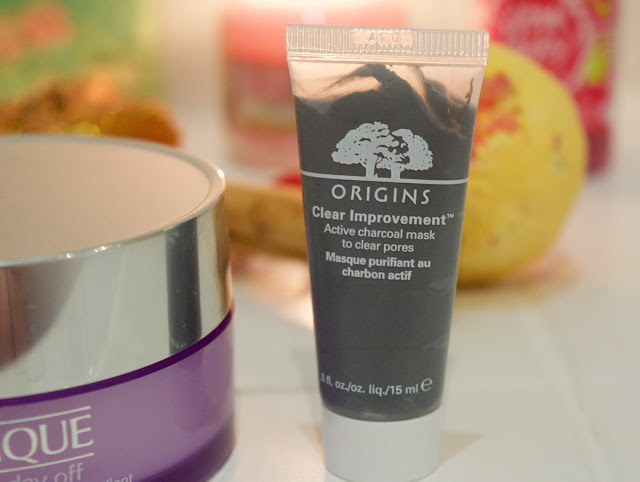 At the moment I’m enjoying this Clear Improvement Active charcoal mask from Origins, which really helps to clear your pores, even if you do look like a bit of a monster while it’s on! 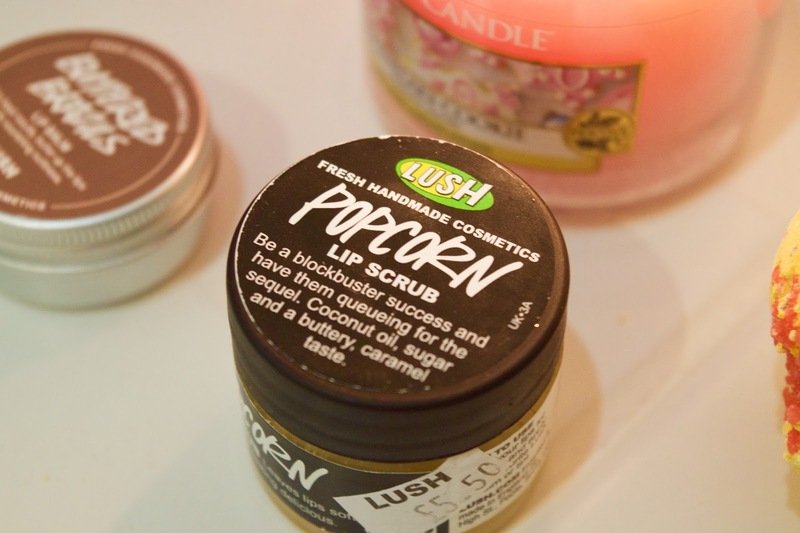 Once I’ve removed the mask, I use the Popcorn lip scrub to exfoliate my lips – I have to be careful not to eat it, as it smells so good! 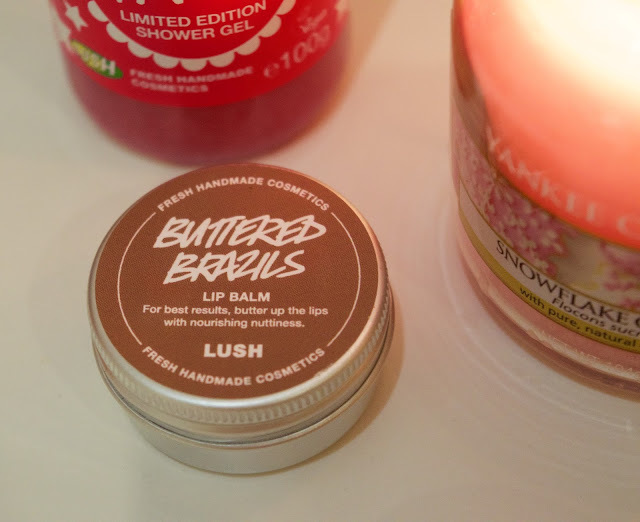 I then pop a bit of Buttered Brazils lip balm on to make my lips feel smooth and soft. Again, it smells good enough to eat, so I have to make sure I don’t just lick it off! Once I’m out of the bath and wrapped up in my big bath towel, I finish my skincare routine. 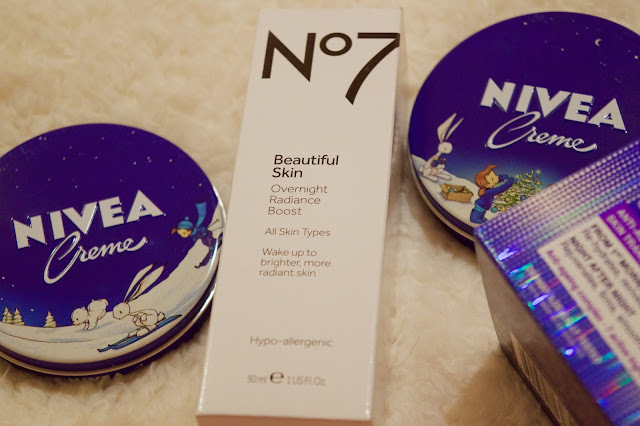 First I apply some serum – at the moment I’m using the No 7 Beautiful Skin Overnight Radiance Boost, which has definitely helped my skin to glow more. 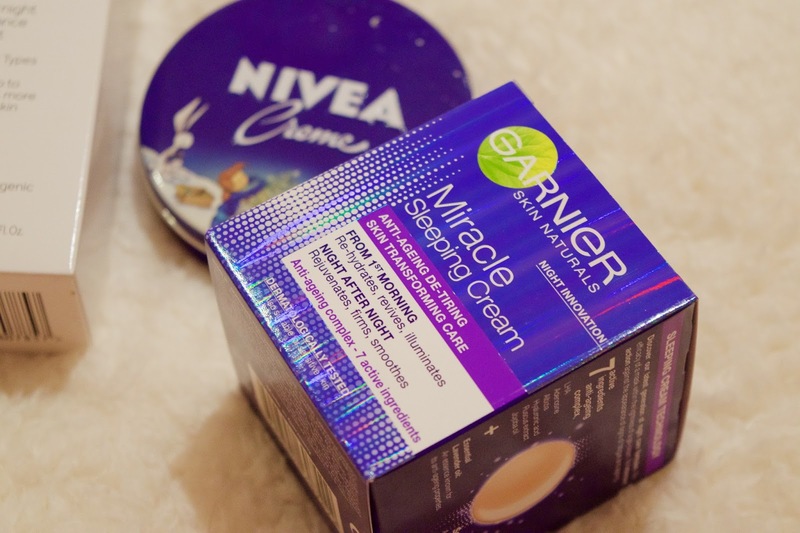 Once that has sunken in, I use this Garnier Miracle Sleeping Cream to really make sure my skin has lots of nourishment overnight. 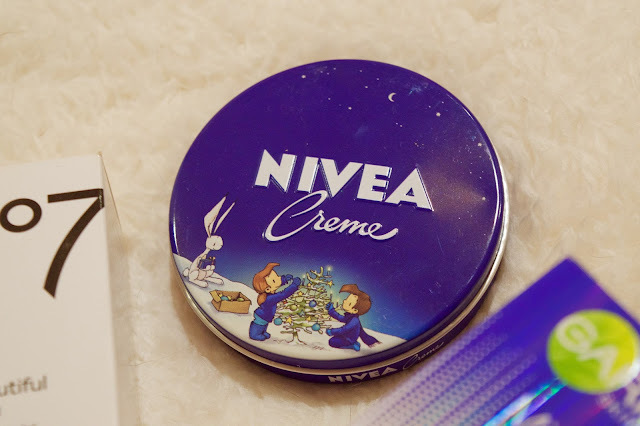 For my body, at the moment I’m using these cute Christmas pots of Nivea Crème* to give my skin some much needed hydration after the cold weather has dried it out. After all that pampering I snuggle into my new Christmas pyjamas. 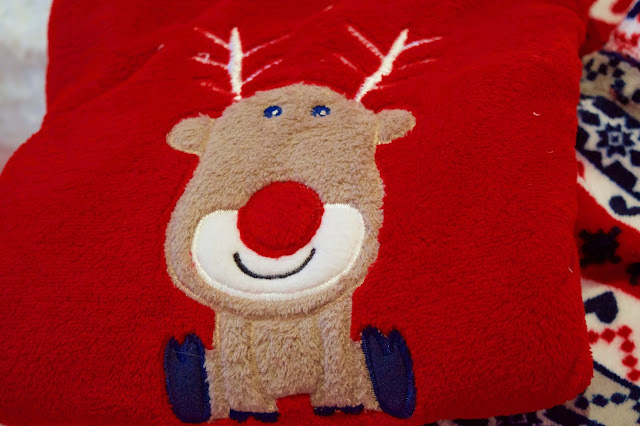 These ones were from Primark and are so soft and warm, perfect to slip into after a relaxing day. 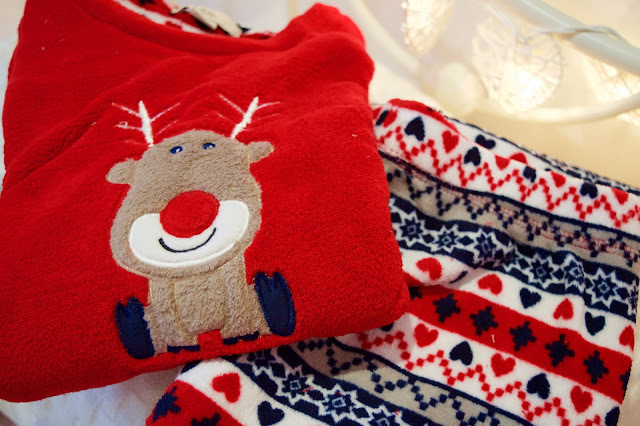 I try to buy myself a new pair of Christmas pyjamas every year, as I always think it’s nice to have new ones in time for Christmas morning. 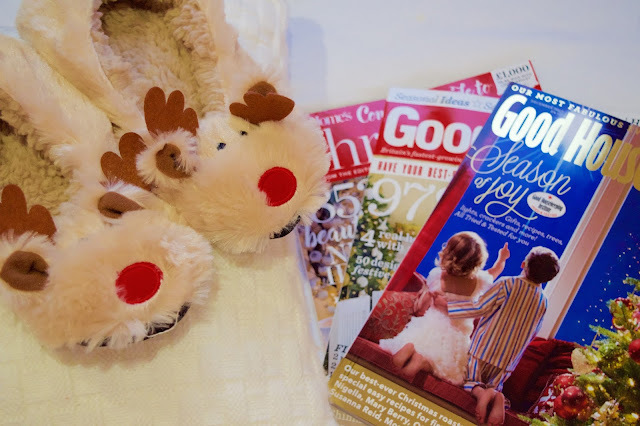 I also put on these new reindeer slippers, also from Primark, to keep my tootsies warm. To finish my day of pampering, I cuddle down in bed with a good book. 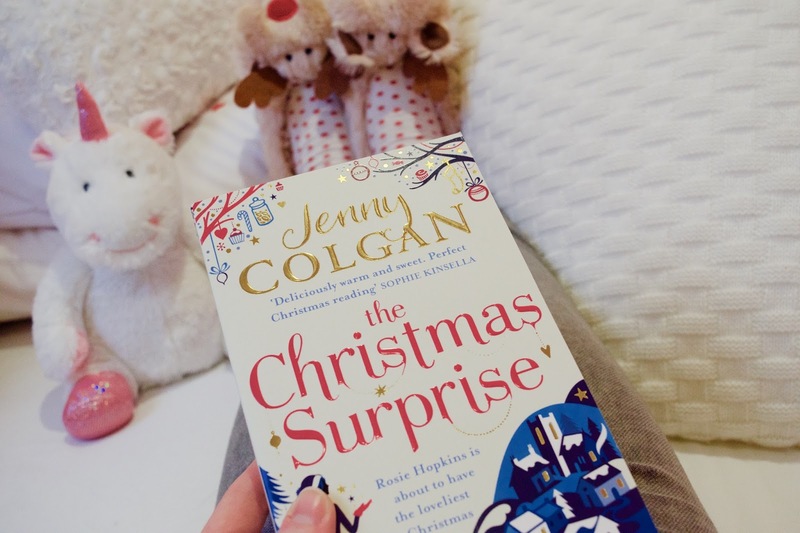 There are so many Christmas-themed books available at the moment, so I picked up this one by Jenny Colgan, as I’ve read a few others by her and really enjoyed them. Then it’s lights out, electric blanket on and I drift into the land of nod. I hope you’ve enjoyed hearing how I spend my pre-Christmas pamper day, and I hope it’s given you a few ideas of how to show yourself some self-care when things are getting too crazy. Do you try and have some pamper time before Christmas? I’d love to hear what you do to relax!